A coalition of Saudi Arabia, the United States, the United Kingdom and the United Arab Emirates, with minor support from several other Middle Eastern nations, has relentlessly bombed Yemen since March 2015. This August, the coalition ramped up the ferocity of its airstrikes, killing dozens of civilians. On August 23, the US/Saudi coalition bombed a hotel near Yemen’s capital Sanaa, killing 41 people, 33 of whom—80 percent—were civilians, according to the United Nations. Then on August 25, the coalition bombed homes in Sanaa, massacring a dozen civilians, including eight members of the same family. There are no other parties presently bombing Yemen, so media cannot feign ignorance as to who is responsible for the attacks. But reports on the bloody US/Saudi coalition airstrikes were nonetheless rife with ambiguous and downright misleading language. AFP‘s news wire (8/23/17), which was republished by Yahoo, the Daily Mail and Breitbart, used the headline “Air Raids on Outskirts of Yemen Capital Kill ‘at least 30,’” again obscuring who was responsible for those air raids. 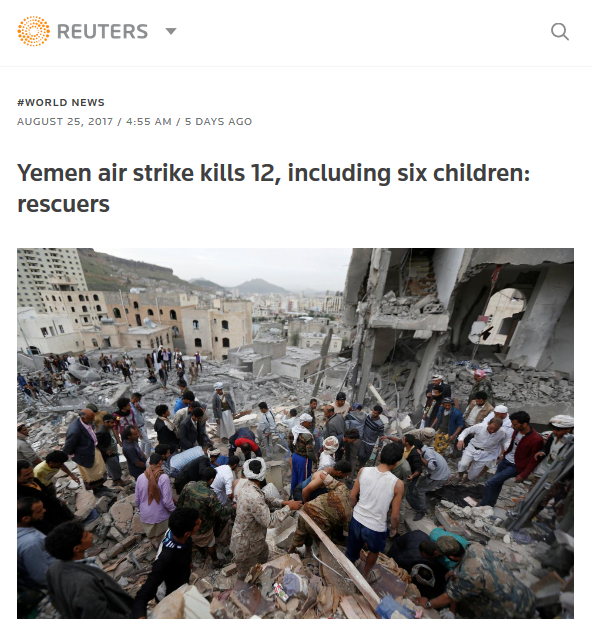 France 24 (8/23/17) ran the wire with the headline “Air Raids on Yemen Capital Kill Dozens.”“Dozens of People Killed as Airstrike Hits Hotel Near Yemen’s Capital,” wrote NPR (8/23/17), in a masterwork of euphemism. Apparently dozens of Yemenis mysteriously died of unknown causes at the exact moment a generic, unaffiliated airstrike hit the hotel. NPR only indirectly mentioned, in the story’s fifth paragraph, that the “Saudi-led coalition” was “blamed” for the attack. The BBC (8/23/17) wrote, “Yemen War: Air Strike on Hotel Outside Sanaa ‘Leaves 30 Dead.’” “Dozens Killed in Airstrike on Yemeni Hotel,” the Guardian headline (8/23/17) read. Whose airstrike was it? What party was responsible? This remains unknown to those who only glanced at the headlines—that is to say, to most readers. The 29-month war has killed thousands of Yemeni civilians, with tens of thousands more injured and millions facing famine. And the United Nations has repeatedly reported that the US/Saudi coalition is responsible for a majority of the civilian casualties. Even when Saudi Arabia’s guilt is acknowledged by media, the crucial role of the US is typically ignored (FAIR.org, 8/31/15, 10/14/16, 2/27/17). Readers miss out on crucial context that is needed to understand the war, and their governments’ contributions to it: Saudi Arabia is flying US-made planes, full of fuel provided by the US Air Force, dropping US- and UK-made bombs, with intelligence and assistance from American and British military officials. Two days later, reports were just as obfuscatory, and even used the term “Yemeni airstrike,” to refer to an airstrike that was carried out by non-Yemenis. “Yemen Airstrike Kills 12, Including Six Children: Rescuers,” Reuters reported on August 25. This brief two-paragraph wire did not once mention the US/Saudi coalition was responsible. “After Yemeni Airstrike, Little Girl Is Family’s Only Survivor,” the international news agency wrote the next day (8/26/17). This Reuters piece noted that the “Saudi-led coalition” was “blamed,” though even that language seems designed to deflect; blamers can be wrong, after all. Major newspapers were similarly misleading. “Young Yemeni Girl Is Sole Survivor After Airstrike Topples Her Home,” the New York Times (8/26/17) reported. The lead provided no further information: “An airstrike toppled their apartment building.” In fact, it was not until the seventh paragraph, after three large photos, that the Times finally conceded, “A Saudi Arabia–led coalition took responsibility for the airstrike a day after the attack, citing a ‘technical mistake.’” The Times did not once mention American or British support for the coalition. Even when Saudi Arabia admitted responsibility for killing Yemeni civilians, media watered down the language. “Saudi-Led Force Admits Strike in Yemen’s Capital Hit Civilians,” Reuters (8/26/17) headlined its news wire. Note the airstrike hitcivilians, not killed them. The attack was also reduced to a mere “mistake.” Larger context was not provided: namely that more than one-third of US/Saudi coalition airstrikes have hit civilian areas, and that there is a growing body of evidence that the coalition has intentionally targeted civilian infrastructure in Yemen. 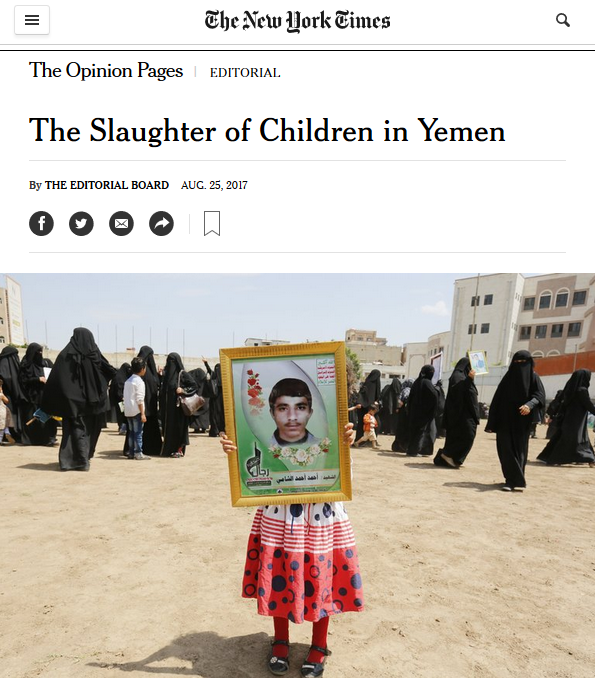 The Washington Post was similarly direct, with its reports “Saudi-Led Coalition Airstrike Kills Dozens in Yemen Ahead of Major Rally” (8/23/17) and “Saudi-Led Airstrikes Kill 14 Civilians in Yemen’s Capital” (8/25/17). To justify this ambiguity in reporting, media might claim it is sometimes not immediately clear who launched the airstrikes. But, again, there are no other parties flying warplanes in Yemen. Yemeni Houthi-Saleh forces, who govern the north of the country and roughly 80 percent of the population, have not been bombing their country. Moreover, the US/Saudi coalition has imposed an air blockade on the impoverished country since March 2015 (another significant fact that is rarely reported by corporate media). In Syria, where numerous rival countries have been launching airstrikes, it is understandable that media may sometimes have to exercise caution before apportioning blame. But this is not the case with Yemen. In the 29-month war in Yemen, there is one party that has been responsible for thousands of air raids: the Saudi air force, as part of a coalition with the US, the UK and the UAE. Yet Yemen is not an isolated case of this ambiguity. Media frequently obfuscate and downplay the culpability for bombing when the US and its allies are responsible. When the US bombed a hospital in Kunduz, Afghanistan, in October 2015, killing dozens of civilians, media scrambled to craft almost laughable euphemisms. 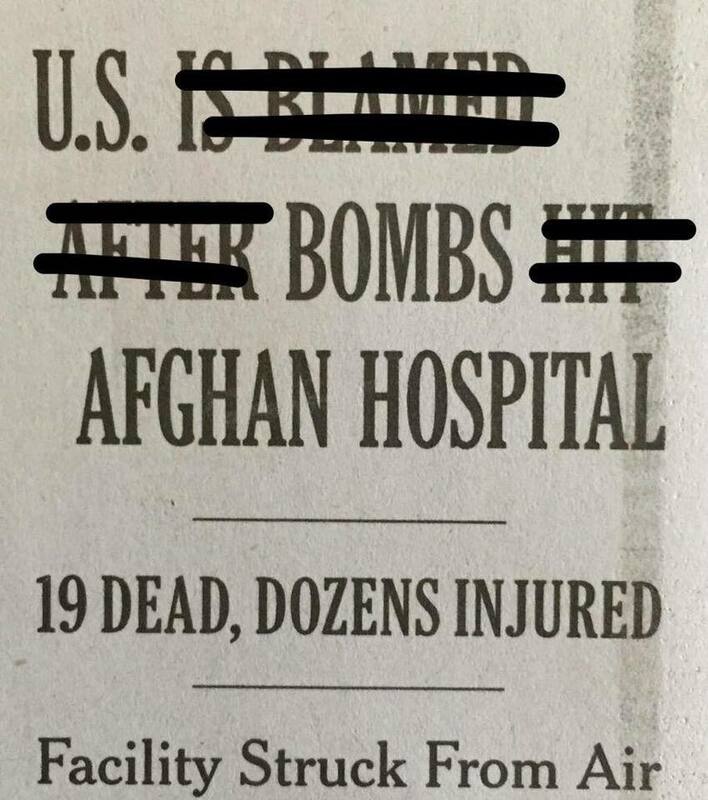 FAIR (10/5/15) documented at the time how news outlets used circuitous headlines like “US Is Blamed After Bombs Hit Afghan Hospital.” Also seen in the August 23 NPR report cited above, this brand of misleading, ambiguous rhetoric is the “officer-involved shooting” of war reporting. On the other hand, the responsibility of US enemies for killing civilians is rarely if ever obscured. It is instructive to compare Western media coverage of Yemen to that of Syria, where attacks are “Assad bombing” (Fox News, 2/15/17), “Assad airstrikes” (Breitbart, 4/28/16), “Assad regime airstrikes” (Times of Israel, 10/16/12; Australian, 8/18/15), “regime airstrikes” (NBC, 8/19/16) or “regime bombing” (Daily Caller, 8/17/15). Media have even written of a “pro-Assad drone” that was “displaying hostile intent,” and thus just had to be shot down by the US (Guardian, 6/20/17; Independent, 6/20/17; The Hill, 6/20/17), as if the robot were personally a fan of the Syrian leader. The phrases “Salman bombing,” “Salman airstrikes” or “Saudi regime airstrikes” are, however, nowhere to be found in reports on Yemen. An admirably direct condemnation in the New York Times (8/25/17) of killing carried out with the help of the United States. Media calling US/Saudi coalition attacks “Yemeni airstrikes” is at best misleading, and at worst flat-out false. Yet this language also has a political effect: It obscures the character of the war. This framing is part of the “civil war” trope media have propagated for two-and-a-half years. When Yemen is discussed, it is virtually always through the lens of a “civil war.” As FAIR (7/25/17) has detailed before, this exceedingly widespread myth, which has permeated media discourse, denies the extent to which the conflict is actually a foreign war on Yemen, led by Saudi Arabia, the UAE and their US and European sponsors. That is to say, if the US wanted the war in Yemen to end, it would end overnight. The “Saudi-led” coalition is only led by Saudi Arabia in name. The Saudi coalition—and its American enablers, who provide military equipment, aerial refueling and targeting—simply cannot be allowed to continue killing civilians and destroying what little is left of Yemen. That is why it is imperative to publicly identify the unconscionable slaughter of innocents for what it is, and to hope that this will shame Saudi Arabia and its American backers to search for a humane end to Yemen’s hell. Reporters at the Times and elsewhere should heed this call to demonstrate journalistic responsibility by clearly conveying their governments’ responsibility for the slaughter in Yemen—not just in editorials, but in news articles, every time. Ben Norton- You have an old, old map in your mind. During the 31 years I was in charge of the Peace Corps we surveyed and mapped the first map of the Yemenis. The north border is parallel to the equator and about 1 mile north of the city of Tarim. Between Yemen and Saudi Arabia there are bands of raiders/murderers that Yemen and Saudi Arabia are fighting. Ben Norton- go back to school before you show your ignorant mind again. The media has never fully reported the continuing US use of carpet bombing, cluster bombs, white phosphorous etc. in the destruction of foreign lands and people, especially in cities. Saudi Arabia never killed Yemeni citizens. I disagree. The fact is that the news IS reporting the killings, and that’s what’s important. Because anyone who cares enough to read the article will know something of the geopolitics or will at least open up a space in their brain to figure it out. They don’t have to report it the way you want every time, even though you are correct that they are much more open to blaming Assad directly. Furthermore the news isn’t calling them all ‘terrorists’ and blaming ‘rebels in the region’ and all the other boogeyman that they usually use to justify carnage. So we’re making good progress here. IS is not reporting the killings. From before IS some of the Sunnis of mid-Iraq have been messaging me that somebody has been pretending to be IS.